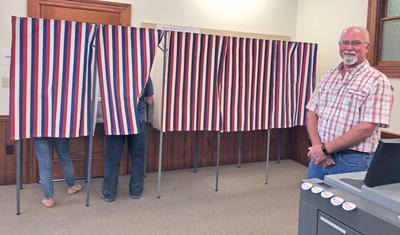 Scott Vogell mans the booths on Primary Election Day, June 12, at Emerson Hall in Castine. Local election results for the June 12 primary. In the first statewide election using ranked choice voting, results from the June 12 primary election are in with about 80 percent of precincts statewide reporting as of 11 a.m., June 13. A referendum question on whether to retain ranked choice voting, a measure approved through a 2016 citizen referendum, passed statewide 54 percent to 46 percent, and by a considerably larger margin in peninsula and island towns, where election results are complete. In the governor’s race for party nomination, Republican candidate Shawn Moody appears an outright winner, with over 50 percent of all votes, while Democratic results await a recount, under ranked-choice voting laws, with Janet Mills narrowly leading Adam Cote, 33 percent to 28 percent, statewide. Locally, Mills holds a significantly larger majority with the exception of Penobscot, where Mills won by a mere seven vote margin out of the 103 votes cast between the two candidates. In the contested Democratic race to represent Maine’s 2nd District in the U.S. Congress, Jared Golden leads with 49 percent to Lucas St. Clair’s 41 percent, with Craig Olson at 10 percent, a race that will also need to be retabulated under ranked-choice voting laws. Local voters mirrored in varying degrees that result with the exception, again, Penobscot, which favored St. Clair. Republican incumbent Bruce Poliquin ran unopposed. For party nominations to the U.S. Senate, both Republican and Democratic candidates ran unopposed, after Republican Max Linn was disqualified. He still received 77 votes in Blue Hill and 63 in Surry. Party candidates to the Maine House and Senate ran unopposed except for Senate District 7, where Democrat Louis Luchini swept the race with 69 percent of votes over Ian Schwartz. And despite Governor LePage’s much-publicized threat to not validate the election results because of his dislike of the ranked choice voting system, a governor’s validation is not required for primary results, only for outright elections to office.